Over / Under 3 Goals Sports Betting is a great way to make your profit on a football match. When placing a wager using this technique, you have to guess whether the total tally of successful goals in a football match will be over 3 goals or under 3 goals. Over / Under 3 Goals Betting works well when you aren't sure which team is stronger or which one will win but you have a reasonable guess regarding the number of goals that will be scored. If you like to bet on sports, this limits the number of outcomes and raises your chances of getting the result you want. 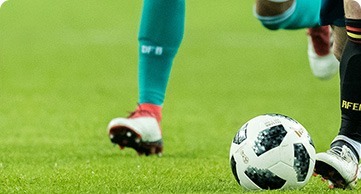 Over / Under 3 Goals is a betting technique which focuses on the total goals scored in a match. The bookmaker you choose will set 3 goals as the goal line and as a punter, you have to choose over 3 goals or under 3 goals. It can be applied to any sport which has a points tally at the end, such as American football or basketball. When betting with Over / Under 3 Goals, if you think the sum of goals scored will be 4, 5, or higher, you would bet on over 3 goals. If you think 2 goals or less in all would be scored in the match, you would bet on under 3 goals. For some bettors, it is preferable trying to guess which team will win. For such players, Asian handicap is the perfect way to secure a profit. Sometimes punters also try to guess the number of goals that would be scored up to half time. If they guess that less than one goal will be scored by the teams in the first 45 minutes of the game, they would place their bet on under 3 goals. Over / Under 3 Goals allows you to skip the stress of deciding which team will win a football match or a game in any other type of sport. Instead, you focus on deciding whether you think the points tally in the game will be over 3 goals or under 3 goals. For example, suppose Chelsea is playing Manchester United and you honestly don’t feel certain of either team. In fact, you may even feel that there will be a draw. When you assess the strikers, you feel that the final result will be 2-2. That means each team would have a total of 2 goals and 4 goals in all would be scored in the match. In this scenario, if you have bet on over 3 goals, you would win your wager. If you had bet on under 3 goals, your wager would be lost. Suppose you bet $200 with odds of 1.90 on over goals. If a total of 4 goals were scored, you would win your wager. You would win $200 x 1.90= $380. Your profit would be $380-$200= $180. Suppose that the match did not end with a draw. Manchester United won with 2 goals while Chelsea got 1 goal. It does not really matter who won. However, the points total, in this case, would be 3 goals. In some cases, when you bet over 3 goals or under 3 goals, the match total is exactly 3 goals. In this case, you would get back half of your wager. Over / Under 3 Goals improves the betting odds for punters. It reduces the number of possible outcomes by eliminating the draw. You just have to decide whether you think that the number of points in a game or goals scored in a match, for example, a football match, will be over or under 3. Punters who use this betting technique can relax, knowing that their odds of having a successful wager are raised from 33% to 50%. That is, instead of betting on one of 3 possible outcomes, they bet on one of two possible outcomes. They have a better chance of making a profit. Bookmakers and punters usually use abbreviations for Over / Under 3 Goals. The most common one is O/U 3. Over / Under 3 Goals offers numerous advantages to punters and this makes it a popular technique for betting on matches where you aren’t sure which team will win. You only have to guess whether the sum of goals scored will be over 3 or under 3. That means you only have two outcomes or 1 in 2 options to choose from. Your chances of winning your bet are 50/50. Over / Under 3 Goals helps you to manage risk when betting at various bookmakers. If you don’t get the exact result that you want, you may not lose all of your money. In cases where the number of goals scored in the match is 3, you get back half of the stake you put in. From almost every angle, both teams work together to ensure that you can make a profit while betting. Goals are the only thing you can count on in any football match that you are betting on. Even if you think no goals will be scored, that will be less than 3, so you can bet on that. While other punters are wondering which team will win or whether the match will be drawn, you can guess, based on historical performance and other factors, what the sum of goals will be. In some cases, it may even seem like betting over 3 goals is an almost certain way to win your bet. After all, some teams have a history of scoring well and rarely leave a match with just one goal. You can experiment with spread betting once you become accustomed to Over / Under 3 goals and give yourself a chance to make even more money.